I have received a few questions about the "feature wall" in our newly renovated main bathroom. Questions like: What made you decide to tile the entire wall? What material did you use? Was it hard to install? Was it expensive? 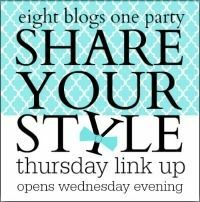 I thought I'd address them all today in this post! Why did we tile the entire wall? When we set out to remodel the "main bathroom", I immediately knew I wanted maximum impact as soon as you entered the room. The bathroom is not large, so I thought it would be fun to inject an unexpected element and immediate "wow" factor right when you walk in. What better place to inject that "wow" feature than on the first wall that you see when you enter the room?! People notice the feature wall right away - even before they walk in to the bathroom since it is visible from the hallway. A floor-to-ceiling tiled wall is also quite unexpected, especially when the wall isn't a "water" wall. What material did we use? We used a herringbone marble natural stone mosaic tile in an unconventional way. You see, the tile is actually a floor tile. If you plan to tile an entire wall like we did, make sure the wall can support the weight. The tile is Allen & Roth. 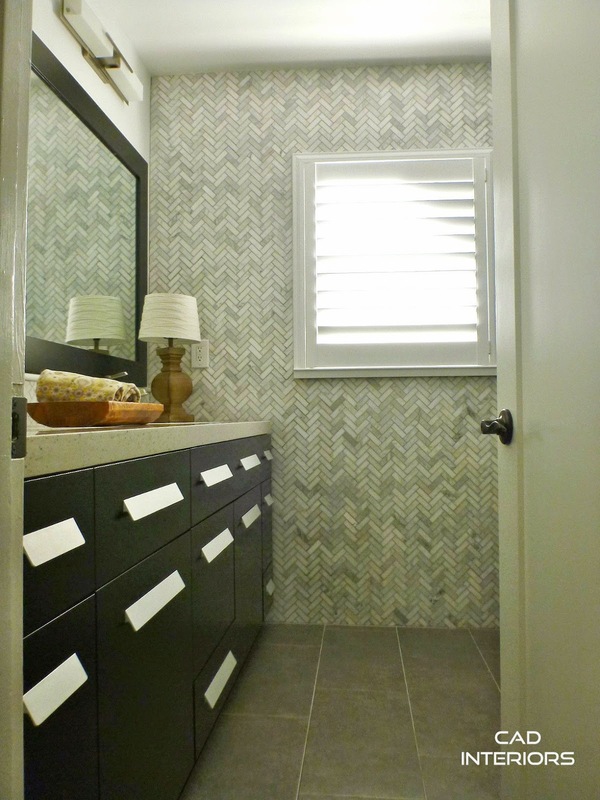 The herringbone pattern (not to be confused with chevron) is a classic. It's been around for ages. 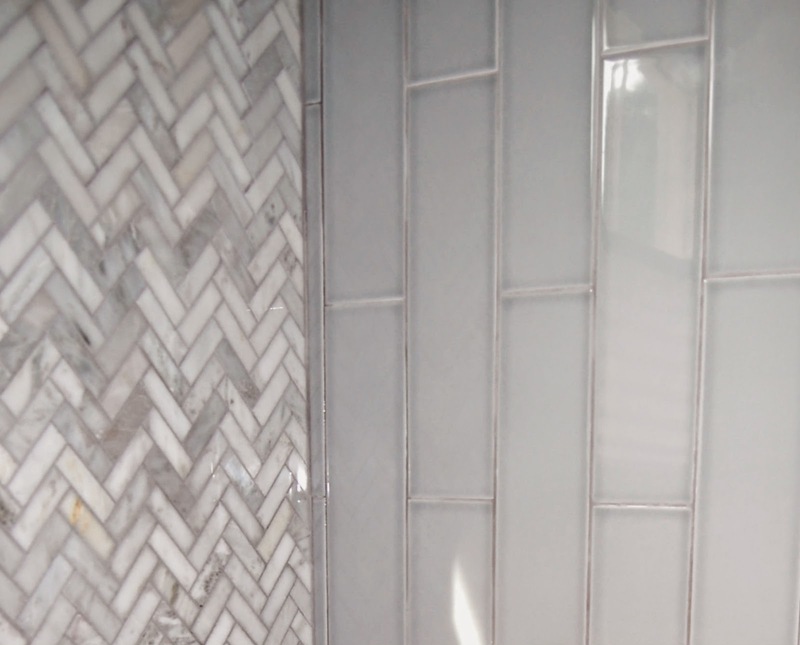 We chose a mosaic tile, rather than having individual subway tiles installed in a herringbone layout, because I felt that the scale of individual tiles installed in a herringbone pattern would be too busy next to the adjacent subway tile. Marble, in general, is very difficult to cut. 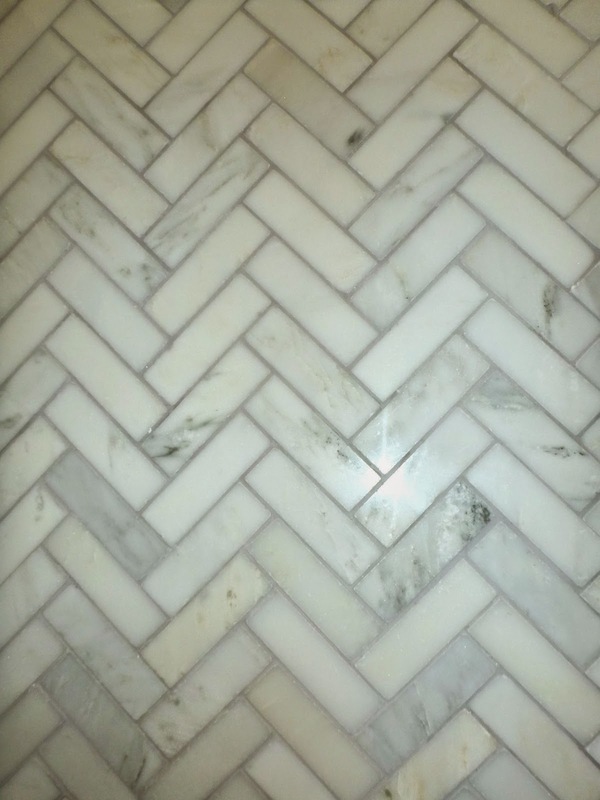 The marble herringbone was even more difficult to cut (without losing stone) because of the "jagged" edges. It was quite labor-intensive to get straight cuts. Because our house is older, the walls are not perfectly "straight" - so that was also a challenge. I think it took our contractor two full days to make all the cuts and get the feature wall completely tiled. Yes and no, and depending on your "standard" for expensive. Like many renovators, we were working with a tight budget. 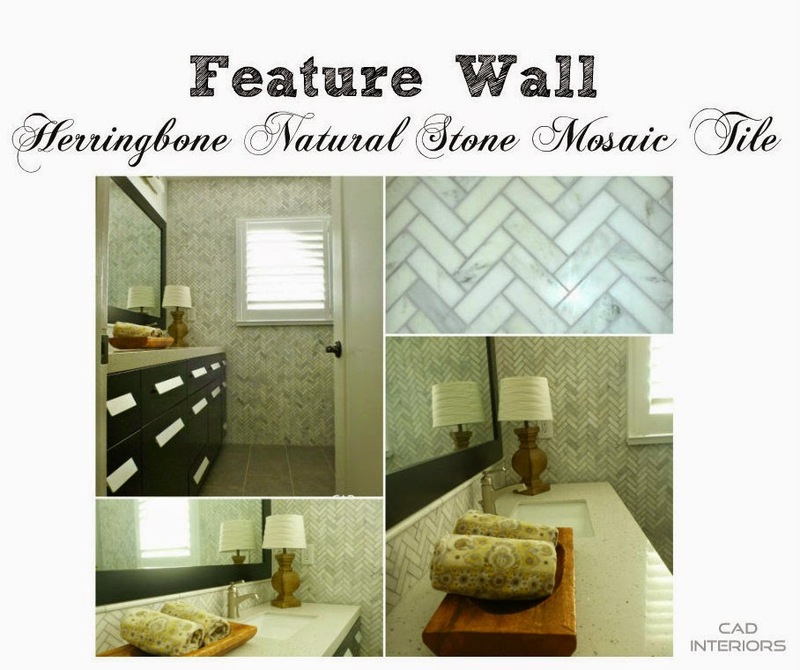 The herringbone mosaic was the most expensive tile we purchased (~$13 per 13x13 sheet), but it also delivered a lot of "bang" for the buck. The cost of tile (materials and labor) for the entire room was definitely the largest cost of the renovation. All the surfaces in the bathroom are tiled (except the ceiling). 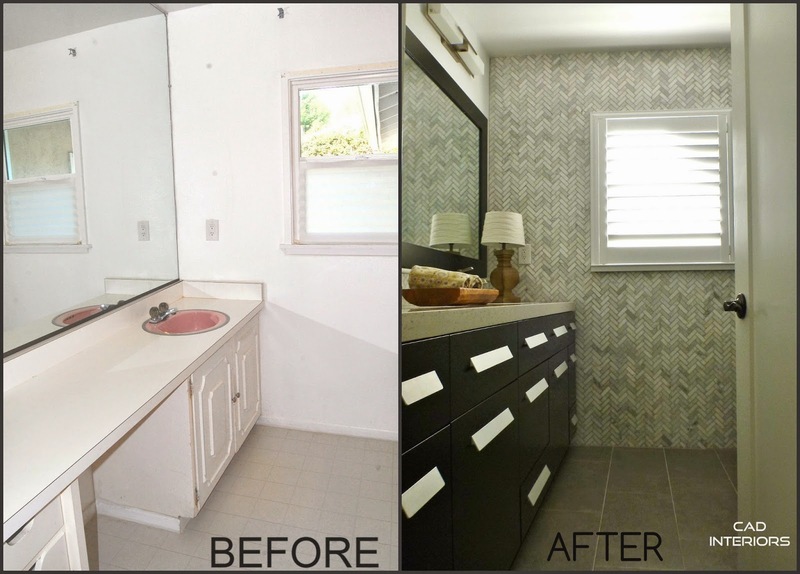 But the tile was key to executing this bathroom design! So, there you have it. I think we achieved the "wow" factor while sticking to a budget, AND staying true to the "classic modern" design concept for the room. That marble herringbone tile is gorgeous. 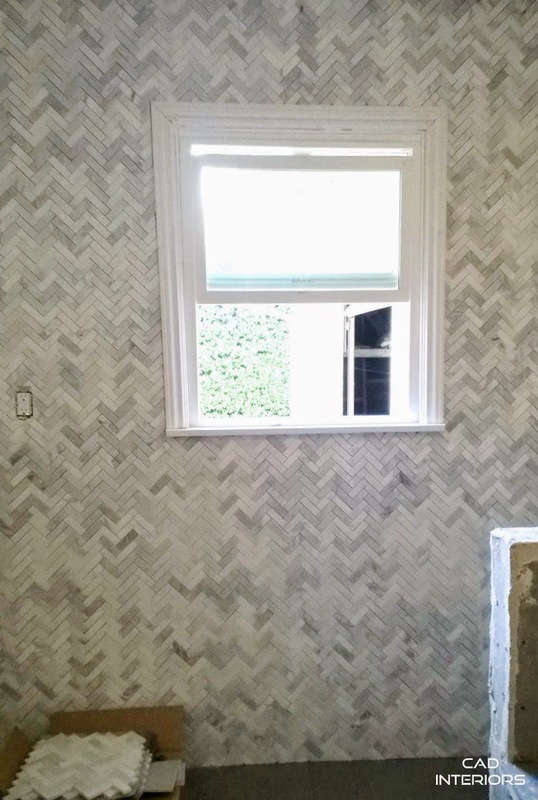 We just laid porcelain basketweave tile on the guest bath floor and it was hard to install too. Same issues with the room not being square.